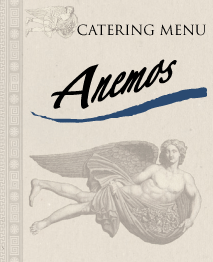 At Anemos Greek Cuisine, our Executive Chef, Sotirios Kontos, and his staff strive to minimize the time any ingredient spends from its source, to your plate and to your palate. We aim to serve you the freshest ingredients, seafood and array of Mediterranean delights. 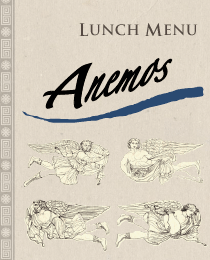 The lunch and dinner menus that Chef Kontos created are nothing short of a Greek cuisine dream. Click on the images below to view our menus at your convenience. We look forward to serving you! Reservations are not required, but are advised especially on weekends, holidays and for parties of 4 or more. We serve lunch and dinner Tuesdays through Sundays and are closed on Mondays. See our Menus page to view our full lunch and dinner menus. We offer catering for any event. Whether you would like to entertain a select group of clients, or host a reception in the restaurant, we offer a number of party possibilities. To request more information please email us or call (732) 414-6590. 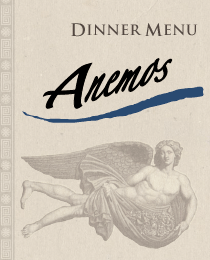 © 2019 Anemos Greek Cuisine. All rights reserved. Site by 43DPI Creative.